Prev box is KC02: Upper Funston Meadow #1. Next box is KC04: Kern Hot Springs west of trail. GPS Waypoints in Region KC	: simple Waypoint+ format, download GPX file, or overlay on interactive map. 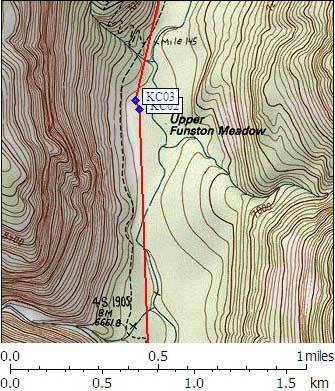 KC03 is a standard box, at about 6700 feet, in the GPS route KERN CANYON. Note: This box is near where Funston Creek joins the Kern River, north of the Big Arroyo and Rattlesnake Creek trail junction, and south of the Chagoopa Plateau trail junction. The map does not show Lower Funston, but it does show Upper Funston Meadow about 5 miles north of Funston Meadow. Follow a spur trail marked with a sign 'campsites' to the east (the trail turns to the northwest). Continue north past the first campsite and box (KLC02)to the second campsite with a standard box (KC03). As you walk in on the above trail you see a 'toilet' sign pointing to your right before reaching KC02. The toilet is perhaps 100 ft down this second trail. About 160 yards north of the meadow a smooth informal trail, worn into the duff of the forest floor, leaves the Kern River Trail and switngs south and east through the trees 250 yards to the camping area. You'll pass a small campsite in the forest north of the meadow, near the pit toilet. The first bear box is at the northeast corner of the meadow, adjacent to the access path. The second is near a campsite 60 yards further south. Coming from the north on the Kern Canyon Trail, you'll encounter this access path ninety yards south of the Upper Funston Drift Fence gate, which is 300 yards south of the High Sierra Trail junction at the foot of the Chagoopa switchbacks. (lat,lon) = (36.4528400, -118.4135700) in decimal degrees, NAD83. (zone,east,north) = (11S, 373407.0, 4034909.0) in decimal meters, NAD27. Scroll down for a regional map of the entire Kern Canyon region.